Magdalene, the 40" 8 shaft Macomber that I restored, is ready to go. 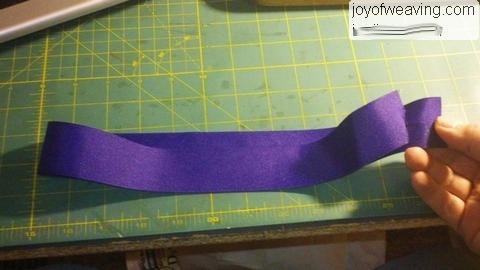 I got some grosgrain ribbon to repalce the apron cloth. I didn't want to hassle with canvas and make new cloth so I took the idea from my Harrisville Designs looms and the way the loom employs grosgrain ribbon as apron strings. 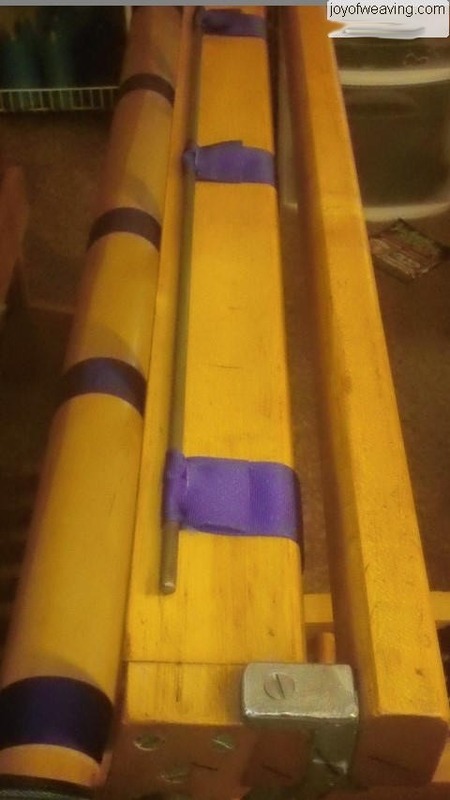 If you need to replace the cloth or grosgrain ribbons on your used or aging loom, this is how you do it. Measure from the beam, over the back beam to the castle. 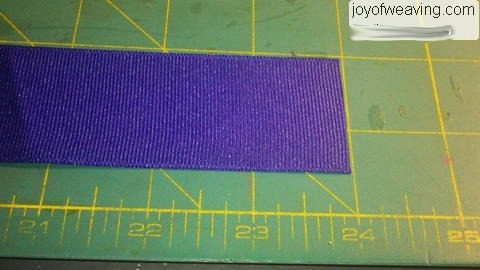 Add a couple of inches to this measurement and cut all your grosgrain ribbons to that measurement. 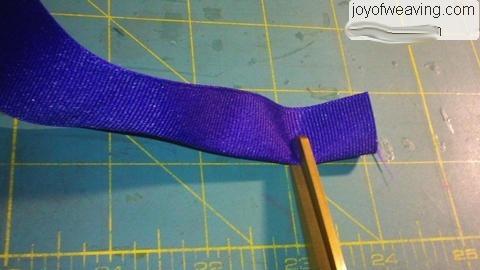 Fold the grosgrain ribbon in half and make a slit 1" from one end. 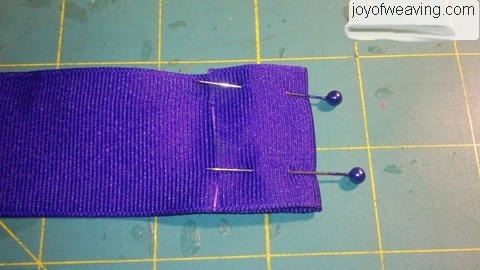 Then take the opposite end and poke it through that slit. 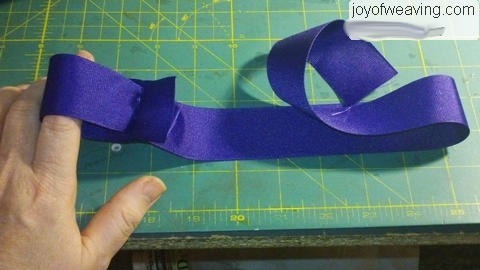 Pull the grosgrain ribbon through the slit and the slit end will end up in a loop. This is the loop that the tie-on rod will go through. Fold the other end 1" to form a hem. 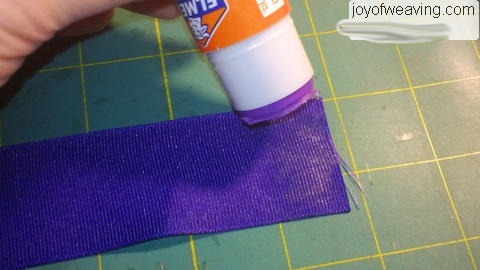 You can glue it and secure it until the glue dries with something (pins, paper clips, etc) or sew it, use fusible webbing or hot glue, it's up to you. Staple or nail the hemmed ends to the beam. Be sure that it's facing the right direction (the same direction that the old apron cloth or strings would have been facing). 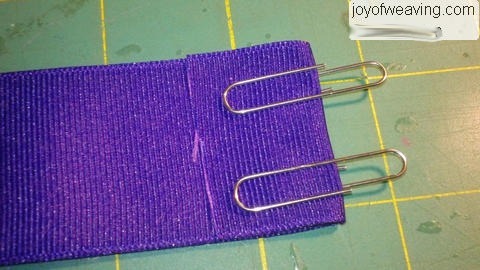 I used the previous holes from the apron cloth as my guide on where to place the grosgrain ribbons. The other thing I did was strip the paint off all the shafts. I used "Citristrip" paint stripper since I needed to work indoors. It worked really well. I planned to spray paint the shafts purple but it's just not warm enough outside, yet, for that to happen. Then I thought of painting them indoors by spraying the paint into a cup outside and then painting the shafts with a foam roller. I finally got the idea to just put the shafts back on the loom, as they were, and wait to paint them until the weather warms up later this spring. 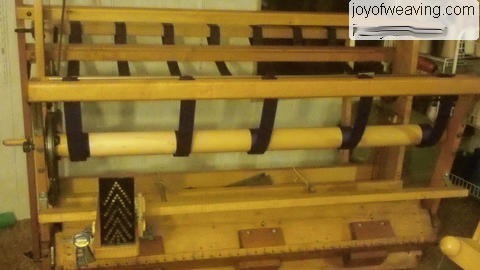 I just finished putting the shafts on and now the loom is ready for my first project.